Ouroboros is a symbol that represents a circle-shaped snake that bites its tail. Also known as Uroboros, it is one of the oldest symbols that represents eternity and infinity. The word ouroboros comes from the Greek language ουροβóρος which means ‘a serpent that eats its tail.’ If you are thinking of getting an ouroboros tattoo – you’ve come to the right place. In this article, we’re going to look at the origins and meanings of this symbol. And as always – we have gathered a collection of ideas at the end of the post, so stay a while to discover more. The meaning of Ouroboros refers to the cycles of nature and the eternity itself. Both these meanings relate to the concept that everything exists in a period. These cycles repeat once in a while and appear as a constant rebirth. We can see this continuity in the four seasons of the year. It also symbolizes the time when the future moment ‘eats’ the present moment forever. In other words, it is a symbol of death and rebirth. A natural cycle of life and death that repeats every moment. Throughout the history, the meaning of ouroboros changed and its purpose was different in each culture. But in almost every region it symbolized the eternal and repetitive cycles of nature, life, and the whole universe. Creation and destruction, life after death, etc. As we have mentioned before, this is a symbol of a reptile (usually a snake), that eats its tail and therefore, forms a circular shape. The oldest found sign of Ouroboros was in Egypt and dates back to 1600 BC. It was found in the form of hieroglyph written on the walls of the mortuary chamber of the Unis pyramid. Scientists think that later other cultures such as Phoenicians adapted it and finally transmitted it to the ancient Greeks. Ouroboros tattoo over the arm. However, the symbol of a snake eating itself appears in many other cultures from different parts of the world. For example, in Scandinavian mythology, there is the same snake with a different name – Jörmungandr. Meanwhile, in Hinduism, this symbol surrounds the turtle that holds the four elephants which carry the whole Earth. Ouroboros symbol also appears in the pre-Hispanic Mesoamerica. But instead of a snake, there’s a Quetzalcoatl, a feathered spirit of Mayan, Aztec, Olmec, and Toltec civilizations. Etymologically, the name of Ouroboros came from the Greek language and consists of two words: ‘oyrá’ (tail) and ‘borá’ (food). The myth of Sisyphus closely relates to the symbol of Ouroboros. One of the Greek Gods punished Sisyphus for his trickery and sent him to hell. As a punishment, he received a painful task of pushing a massive rock to the top of a mountain. At the point when he reached the top, the stone would always roll back where it was, forcing Sisyphus to start his meaningless work again. The ancient alchemists used Ouroboros as a symbol that represents their searches for immortality. Apart from being a beautiful design, it also has many symbolical meanings around it. If you’re not sure which one to choose, let’s take a quick look over the initial concepts of Ouroboros. The most significant meaning of Ouroboros is eternity and cycles of life, nature, and the universe. As the snake eats itself, it sustains its life and renews. The ancient people used the snake as the primary character, not by accident. They knew that renewal is a crucial part of every reptile species. So, by creating an Ouroboros, they created a symbol of renewal and rebirth. Moreover, there are some species of lizards that can eat their tail to stay alive. When its life is in danger, a snake can get rid of the tail to escape. The primary reason why they can do it is that later their tail regrows. An Ouroboros is infinite; it doesn’t have the beginning or end. It represents the neverending, immortal cycles that continually regenerate and repeat. In other words, you can put the concept of the life, nature, and universe into the Ouroboros symbol. Our lives constantly reborn, and even after we die, we still exist in some form. So, the Ouroboros also embodies the concept of life after death. Ouroboros also has great importance in alchemy where it appears in two colors: red and green. For the alchemists, the green color is a symbol of the beginning of things, while the red represents the end or the death of something. Generally, Ouroboros symbolized the searches of eternity and immortality by the ancient alchemists. If you are looking for a symbol that would represent the eternity – this is an excellent option. The most popular tattoo of Ouroboros is a circular, black and grey snake or a dragon. Often, you can’t even see the mouth because the designs are very minimal. But you can recognize it by the eye and the mouth line. As we have gone through hundreds of pictures, we noticed that people prefer small, monochrome Ouroboros tattoos. But we encourage you to be creative, and if you want to add more color – do it! After all, it’s your tattoo, and it has to be the way you want. 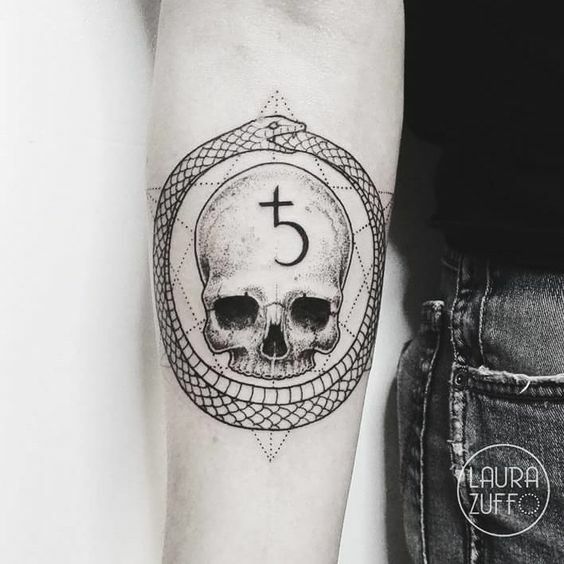 But if you’re still not sure what kind of style you would like to get, take a look at our collection of Ouroboros tattoos – we are confident that you will find the inspiration. Here are some of the best designs that will help you to decide what do you want.